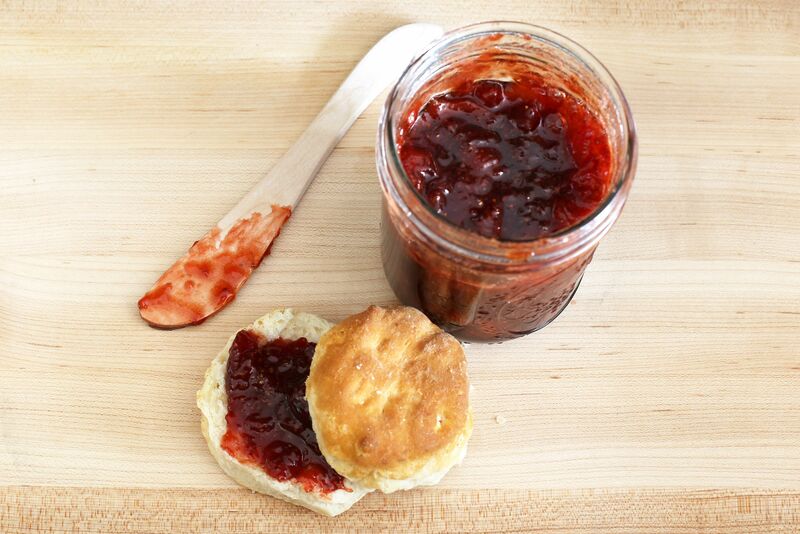 This easy strawberry jam batch is made with only 3 ingredients. The delicious jam is pectin-free and super easy to cook. This classic rhubarb custard pie is a super easy preparation, especially if you use a frozen pie crust or ready-made pastry. The rhubarb filling is a custard-like mixture made with eggs, milk, and sugar. Red cabbage is mixed with a sweet and tangy dressing, raisins, and pecans. Serve this flavorful red cabbage slaw at your next cookout. Fresh blueberries and lemon juice team up in this fabulous fresh and refreshing blueberry lemonade recipe. For a special event, add mint sprigs to each glass. Continue to 5 of 38 below. Fresh tomatoes and simple seasonings are simmered to perfection for these simple stewed tomatoes. Serve them with croutons or add them to recipes. Add some lightly sauteed onions and celery if you like. The combination of savory vegetables and pecans in this roasted brussels sprouts and butternut squash with cranberries dish might make you think fall or winter, but don't wait for a holiday dinner to enjoy these delicious roasted vegetables. This easy blueberry lemon curd gets extra flavor from fresh lemon juice, and it's very easy to make with fresh or frozen blueberries. Butter and lemon juice give major flavor to these quick and easy snow peas. Continue to 9 of 38 below. Browned butter and sage help flavor this simple butternut squash and pasta dish. This is a delicious way to enjoy fresh butternut squash, but another similar winter squash may be substituted. Use rombi pasta, farfalle, or a similar flat or ruffled pasta. Purple hull peas are found at farmers markets in many areas of the South, and you might find them frozen in some supermarkets. Use regular black-eyed peas if purple-hull peas aren't available. This purple hull pea and sausage recipe is easy to prepare with simple seasonings and sliced andouille sausage. This elegant fresh spinach salad with figs and a warm bacon dressing has plenty of flavors. This is an excellent salad for a dinner party or special occasion meal. This easy recipe is an excellent way to enjoy fresh kohlrabi slaw. It's made with a basic seasoned vinegar dressing. Continue to 13 of 38 below. This flavorful garden relish with cucumbers and green tomatoes is a great relish for hot dogs or sausages. This easy zucchini and summer squash casserole is a great way to take advantage of the season's summer squash bounty. The sliced squash is baked with seasonings and a Parmesan and breadcrumb topping. These peach preserves are made with the addition of pectin. These lightly spiced peach cobbler preserves are full of flavor. These homemade spiced pear preserves are made without added pectin. The preserves are made with some brown sugar and cinnamon sticks. Continue to 17 of 38 below. Sour cream adds flavor and smooth texture to this delicious fresh blackberry ice cream. It's a fresh and simple blackberry ice cream recipe. The simple honey and brown sugar glazed baby carrots are perfect. The preparation is fast and easy and they make a great side dish for a big family meal or holiday dinner. Here are some of our favorite recipes using fresh seasonal farmers market produce, including recipes for Swiss chard, spinach, figs, kohlrabi, squash, cucumbers, and more. A little Dijon or spicy brown mustard adds zip to this delicious cheddar cabbage casserole. Serve this flavorful cabbage casserole as part of a family meal, or serve it along with a holiday dinner. Serve these flavorful turnip greens with ham shanks with hot baked cornbread or cornbread muffins. The turnip greens are cooked with ham shanks and flavored with some garlic, onion, and cayenne pepper. Continue to 21 of 38 below. The sour cream and mayonnaise dressing makes this fabulous creamy fingerling potato salad creamy and delicious. The salad may also be made with new potatoes or small red potatoes. This crustless Swiss chard and bacon quiche is a snap to make, and relatively light, high protein, and gluten-free. This eggplant casserole with cheddar cheese topping is similar to a savory bread pudding. It's made with a layer of buttered bread and a mixture of eggs and cheese. This flavorful homemade tomato ketchup takes time, but the final result is well worth the effort. We start this the day before, then we refrigerate the tomato pulp and liquid mixture to boil down and process the next day. Continue to 25 of 38 below. Brown sugar and spices make a tasty sauce for these quick and easy candied golden beets. Roasted okra and tomatoes are such an easy dish and one great thing about roasting okra is that it seems to diminish that off-putting "slimy" texture. Pesto and lemon juice help to flavor this tasty rotini garden pasta salad with vegetables. Add a little diced cooked chicken, shredded cheese, or ham for a heartier supper salad. This fresh and delicious rhubarb crisp with cinnamon is made with an oat crumb bottom and top crust. The sweetened rhubarb filling is flavored with a little cinnamon and vanilla extract. Continue to 29 of 38 below. This fresh and chunky pico de gallo salsa, shown here on beef and bean burritos, is the perfect combination of chopped fresh tomatoes, onions, chile peppers, and cilantro. Lime juice and salt and pepper are all you need to add. If you wonder what to do with the garlic scapes you picked up at your local farmers market, this dressing is a good idea. This tasty garlic scape salad dressing has a light garlic flavor and beautiful green color. This fresh strawberry cake with cream cheese frosting is a fabulous spring or summertime dessert. This homemade fresh fig jam is made with fresh figs and sugar. The jam is simmered to the gel stage with no added pectin. Continue to 33 of 38 below. This spicy kale and mustard greens with cajun sausage have a nice kick to it. Sliced cherry or grape tomatoes are added near the end of the cooking time. This fresh blueberry jam with pectin is the perfect way to preserve fresh blueberries. The raspberry puree adds nice color and flavor to the chopped peaches in this delicious jam. The jam is made with the addition of pectin. These slow cooker orange glazed carrots are flavored with a fabulous sweet spiced combination of cinnamon, fresh orange, and brown sugar. Continue to 37 of 38 below. Swiss chard with bacon is an easy green to grow and it cooks quickly, much like spinach. This creamed Swiss chard is made with some cooked crumbled bacon, a little onion, and a simple white sauce.